Experts have stated that robots are a great way to introduce children to STEM and this is one of the reasons we see so many robotic toys and kits that are introducing STEM concepts to the little ones – some good, some not so good. Some of them actually lack the personality it takes in order to truly connect with the little one. However, WowWee, a well-known toy company has found a way to connect with children – this is when they introduced the WowWee Elmo coding robot. Who is Creating this Robot? Sesame Workshop and WowWee Robotics are working together in order to co-develop the Emoji Coding Robot. This new toy made its debut at the CES in Las Vegas this year (2017) and it is expected to ship later this year. Emoji looks and works like WowWee’s Coji coding robot, which many of you may already be familiar with. This robot would be best for children that are three years and older. That’s right, children as young as three can start using this robot! Elmoji will be teaching little ones basic programming skills by utilizing the language of visual emojis. If you haven’t already figured it out, “Elmoji” is an abbreviation for Elmo along with his Emoji friends. Through an app (free of charge), Elmoji helps build those reading skills. He also allows the little ones to play games that control the actions of Elmoji. He also reacts to physical stimulation, like shaking and tilting. He has thousands of animations on his LCD screen, not to mention the dynamic sounds. This is a fab robot that will teach children how to code using Emoji’s. Together, WowWee and Sesame Street are creating an Elmo-themes version of the popular Coji, which looks like a whole lot of fun packed all in one toy. The robot teaches children STEM skills. Personally, we like the approach these companies have taken and it is a great way to get in the minds of the little ones so that they can learn while they’re having fun with one of their favorite characters. Mind you, this isn’t just one of those branding exercises – these two companies are working together in order to come up with educational content that will capture the attention of their audience. Of course, Elmoji isn’t going to teach children how to build a robot that can cook dinner, but like we said before, it’s going to introduce the little one to STEM skills as well as a programmatic way of thinking. Back in 2015, there was a study that was conducted on children who watch “Sesame Street.” It appeared that those children did better in elementary school. In fact, experts have stated that “Sesame Street” may be the most affordable and biggest early childhood intervention you can find. 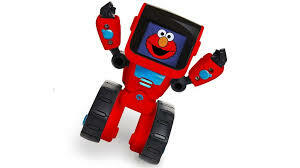 So, offering toys like this makes perfect sense – Sesame Street and robots make a great combination. Elmo is the most popular character on Sesame Street – this is a character that many younger children know and can easily connect with. If all goes well with WowWee Elmoji Coding Robot, something tells us that there may be other Sesame Street themed coding robots being introduced by the company in the future. seamlessly connect to and interact with your smart devices.